Source: Global Times. 13 May 2010. Six worker suicides in less than five months have put the management of Taiwan-based company Foxconn under a microscope again after another of its employees jumped from a building and died Tuesday in Shenzhen, Guangdong Province. The six suicides and two-failed suicide attempts so far this year have prompted the company's management to invite monks from Wutai Mountain, one of the most sacred Buddhist shrines, to pray for a positive working environment. The latest suicide involved a female surnamed Zhu, 24, a Henan native, who reportedly plunged to death from her apartment in the Longhua district Tuesday night. A police investigation is ongoing, the Xinhua News Agency said. Foxconn, a unit of Taiwan electronics giant Hon Hai, has been plagued by suicides this year. On May 6, employee Lu Xin jumped to death from his apartment. His colleagues said Lu was an open-minded worker who enjoyed singing, dancing and traveling. Another worker surnamed Li also leaped to his death on March 11, after his bonus was reportedly stolen. Six days later, another female employee jumped out of her dormitory building and injured herself, claiming she was under heavy pressure. The company's management has been blamed for the wave of the suicide attempts. A report by China Central Television said slogans such as "every second counts" are displayed at the company. "There are good management rules for superiors, but when it comes to management at the grass-roots level, it is chaotic," said Ma Liqun, the elder sister of Ma Xiangqian, who jumped to death in January, a report by CCTV said Wednesday. Ma said workers in the company are trained to "work like machines and there is no respect." For entry-level workers, the average monthly income is about 1,000 yuan ($146) and working overtime can help raise their salaries an extra 600-yuan ($87). As a result, working overtime is a common practice for many newcomers or fresh graduates, the report said. Wan Hongfei, one of the senior managers at Foxconn, Shenzhen, told CCTV that the turnover of lower eschelon workers is high. Liu Kun, a spokesman for the Shenzhen branch of Foxconn, admitted after Lu Xin's death that there are shortcomings in management. However, he said that the company had tried to prevent the tragedies, making special arrangements for employees, such as allowing Lu's friends to share a room with him. Recently, the company invited monks from Wutai Mountain to pray for their employees, Chengdu Evening News reported Wednesday. An employee called for revamping of the management style, and more psychological help to the workers. "The workload and lack of care are only two factors. 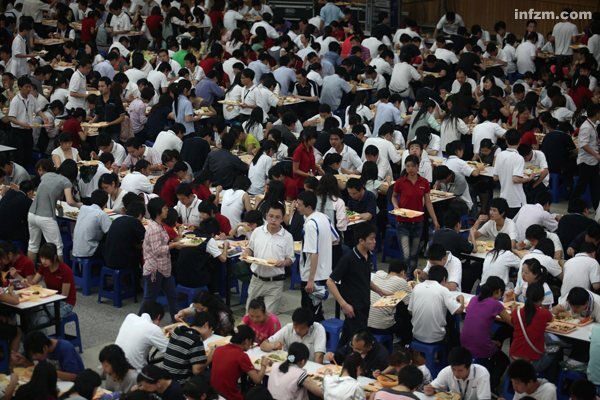 Other factors, like limited social circles, no services to treat depression and the inability to adapt to high pressure also lead to their desperation," an employee with Foxconn, Shenzhen, told the Global Times Wednesday.